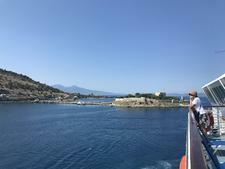 Passengers sailing into the Turkish port of Bodrum first see the Castle of St. Peter, a dominating 15th-century crusader outpost that sits between a yacht marina and a bay. Gullets, the traditional Turkish wooden sailing yachts, bob on the South Aegean's salty, blue water, and buzzing outdoor cafes and "beach" clubs that jut out on wooden piers line the shore. 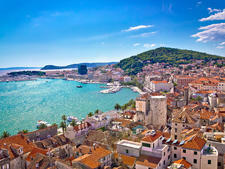 The port city is awash in Greco-style buildings: sparkling white cubes covered with purple bougainvillea. You might actually think for an instant that you're on another Greek island -- Kos is, indeed, easily visible in the distance -- until you hear the sound of the muezzin and glance up at the handful of minarets poking through the sea of square structures. Make no mistake: This is very much a Turkish city, brimming with locally built boats, bustling bazaars and plenty of regional cuisine and character. Bodrum most regularly hosts ships from luxury lines like Seabourn Cruise Line, Azamara Club Cruises and Windstar Cruises, usually as part of Eastern Mediterranean cruises to the Greek Isles. The occasional bigger ships -- from Celebrity Cruises, Holland America Line or U.K.-based Thomson Cruises and Fred. Olsen -- may also be on the schedule. 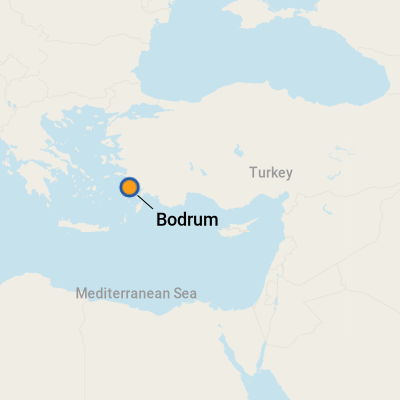 One geographic note: Bodrum proper is actually situated on the Bodrum Peninsula, which, in addition to the city, encompasses numerous other resort towns like Gumbet, Turgutreis and Gumusluk, many set on semi-circular bays carved out of the rocky land. For beach bums in particular, one or more of these may be worth visiting. Cruise ships visiting Bodrum dock at the Bodrum Cruise Port. The port is located on the edge of town, about a mile from the castle. The modestly outfitted terminal building houses customs offices, a duty-free area, car rental office, restaurant and cafeteria. There isn't much to do in the immediate vicinity, which is underdeveloped, so most visitors will immediately head for town. In the crowded bazaars, take precautions with your valuables. Also, shop owners have been known to hound tourists, but you should be able to get the message across with a smile and a firm "no thanks." It takes 20 minutes to walk from the pier to the Castle of St. Peter, which is near the center (older) portion of town. If a day in town spent shopping and dining is all you're after, Bodrum is easily walkable. Many operators, like luxury outfit Seabourn Cruise Line, will set up a complimentary shuttle service to take passengers from the pier to the center of town. The port also typically organizes a shuttle boat service that takes passengers from the pier to a spot next to the castle. The standard schedule has the boat departing the pier on the hour and returning from the castle on the half hour, but times may vary. The trip costs one euro each way (two euros roundtrip). Passengers looking to go farther afield will want to take a taxi (should be about 15 euros to get to Bitez, 12 euros to Gumbet and 40 euros to Gumusluk) or dolmus (which means "stuffed"), one of the green public mini-buses that connect Bodrum to other towns on the peninsula. The bus station is located on Cevat Sakir, about five minutes by foot from the castle. The currency is the Turkish Lira (TL). ATM's are available throughout the port, with an especially high concentration located near the castle. Visit www.xe.com for up-to-the-minute exchange rates. Because the economy is partly reliant on European, U.K. and American tourists, shops and restaurants may also accept euros, pounds sterling and dollars (as well as credit cards). 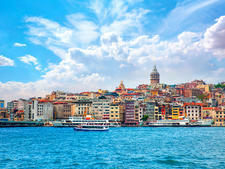 It's Turkish, but you'll have little trouble with English communication if you stay close to the harbor or are visiting the staple tourist sites. Many taxi drivers, however, have limited English language skills. The marina, where most cruisers spend the day, is lined with al fresco cafes, typically overpriced restaurants serving a mishmash of regional Turkish food (salted fish, stuffed vine leaves, grilled meats), seafood, burgers, Mexican, Asian, Italian, pizza and casual Turkish options (kebabs!). Wash it all down with raki, a Turkish liqueur produced from anise. The marina restaurant scene is mostly an international mix of mediocrity. But, you're paying for the buzz, the people-watching opportunities and the lovely views of bobbing motor-yachts. As a general rule, tips of 10 percent are customary. That said, there are certainly a number of standout spots in town. Bodrum is known for its handmade leather sandals, and Ali Guven is the star craftsman. (He's supposedly cobbled for celebrities like Mick Jagger.) His shop is located at Carsi Ici, Ziraat Bankasi karsi. Bring cash, or buy a knock-off pair from one of the bazaars.